Casa Tamara ( 2 independent units upstairs and downstairs) is a very special villa! Just open the garden gate and you will be on an 8 mile stretch of beautiful sandy beach, with calm waters, known as the best swimming beach in Rincon. Each unit has a master bedroom with queen size bed and private bathroom and 2 other bedrooms with 2 twins in each, which can be made into a king if requested. The downstairs has 3 full bathrooms, 2 are within the bedrooms, one in the hallway; the upstairs has 2 full bathrooms, one in the master bedroom and one in the hallway. The living rooms open on to a covered patio. We dine on the patio, facing west - The Caribbean - and watch the fabulous sunsets. We have WI-FI, Satellite TV, air conditioning in all bedrooms, ceiling fans in all rooms and on the porch and private off street parking. Master bedrooms have their own TV. Great for a family vacation or rent both units and have 6 bedrooms for a larger group. Casa Serena (2 units side by side) is perfect for a secluded get-away or a family vacation. You can swim, snorkel, kayak, walk for miles or just relax in the sun right on our calm Caribbean beach, the best swimming beach in Rincon. Each unit has a master bedroom with king size bed and full bathroom within, and a second bedroom with 2 twins which can be made into a king and there is a second full bathroom. We have AC in every room as well as ceiling fans throughout, satellite TV, Wi-Fi, washer and dryer, private driveway and much more. After a day on the beach or enjoying all that Rincon has to offer, come inside and cook dinner in our fully equipped kitchen, barbecue on the patio and enjoy all the comforts of home in our beautiful house. Our enclosed backyard is great for kids. Casa Bomberos offers privacy and spacious comfort for up to eighteen persons, in a beautiful home in the middle of Puntas Hills of Rincon, Puerto Rico. The home can be rented as a six bedroom, a four bedroom or a two bedroom. Casa Bomberos is named after the professional career firemen from New York that own it. The home is made up of two separate rental units of four bedrooms and two bedrooms and the the entire house is available as a single vacation rental. Casa Bomberos is located within a five-minute drive of the best beaches in Rincon. A 16' by 32' pool has been added to the house, with outdoor bathrooms and showers. There is also a pool side tiki bar with plenty of room to entertain. Our location is very private- many of the locals don’t even know our road exists. We are surrounded by lush gardens on a quiet cul de sac road, right off Road 413. Our nights are filled with the sound of the Coqui tree frog. As you look up, you'll see thousands of stars in the country night. Our driveway provides plenty of parking. Casa Bomberos is the perfect house for those that appreciate value. It has plenty of room for four couples upstairs, or two couples downstairs. Bring all the kids and everyone has their own beds. Click here for more details on this exciting property! Villa Amarone Located 100 miles west of San Juan at the most western point of the island. Tranquil, private, secure and very, very well appointed...The amenities will exceed your expectations..I promise. You'll have the best of both worlds, beach and emerald green foliage views! Rincon is a feeling more than a destination! You will love Rincon. Larry Sweeney (Owner) Call: (787) 309-6889 Click here for more information on this property! The Tres Palmas Inn and Villas is a 4 acre estate located at the Tres Palmas Marine Reserve in beautiful Rincon, Puerto Rico. The property offers amazing views and the tropical peace and quiet you so deserve, including the most amazing sunsets in Puerto Rico. Additional accommodations (VRBO 496362, VRBO 500733). Click here to see all of our properties! Please click here to see a fantastic arial video of our property! cienda Ensenada is a modern home located on over 4 acres of beachfront land in beautiful Rincon, Puerto Rico. This 4-bedroom, 4 bathroom home accommodates 8-10 people comfortably. It offers a private swimming pool, grill, Satellite TV and WiFi internet, full kitchen with microwave and dishwasher. It is located a minute away from the most beautiful beaches in Puerto Rico and the Tres Palmas Marine Reserve. You can enjoy the most amazing sunsets as you relax on the swimming pool or dine on the oceanview terrace. Get more information on this property by visiting our VRBO page. If you need additional space, please check (VRBO 496362, VRBO#500733). The lemon house is a charming cottage on a 4-acre marine reserve beachfront estate. This one bedroom, one bathroom cottage accommodates 2-4 people comfortably. The property is fully equipped with a/c, ceiling fans, plasma, satellite TV and wireless internet. Located a few minutes away from the famed steps beach and the Tres Palmas Marine Reserve you will enjoy quiet walks on the beach, snorkeling, swimming and the most amazing sunsets in Puerto Rico. If you need more space, please check VRBO#492812, #496362, #514395. The Coconut House is a lovely cottage located in a 4 acre beachfront marine reserve estate. Recently remodeled, this cottage has 1 bedroom, one bathroom and it is designed loft style with a second story for the bedroom, 2 futons in living room and small porch with mountain views. Lovely, fun, and intimate for a couple or family with school age children. It has air conditioner and ceiling fans. WiFi, Cable TV, Parking, Fully equipped kitchen and access to washer and dryer. The Cottage-It is a bright 2 story cottage with great ocean view from the Master Bedroom.It features amazing sunset views, WiFi, Satellite Dish TV, access to Washer and Dryer, Fully equipped kitchen, A/C in all bedrooms and close to the famed Steps Beach and the Rincon Marina. It accommodates 4-6 guests. Will become available in June 2015. It is a Single Room with Private entrance with a full bath. It features WiFi, Satellite Dish TV, access to Washer and Dryer, A/C and Ceiling fans in bedroom, and close to the famed Steps Beach and the Rincon Marina. It accommodates 2 guests. Looking for the perfect Caribbean Vacation? Want to just get away from it all? Try Villa Avalon in Rincon, Puerto Rico. Scenic views, tranquil settings, oceanfront property on the Caribbean Sea with a wonderful beach. Fully equipped kitchen with tiled counter, microwave, dishwasher, 4 bedrooms (1 King, 2 Queen, 1 Twin), TV, VCR, 5 bathrooms. What more can you ask for? 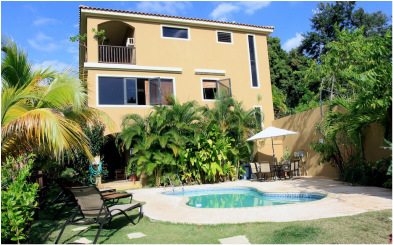 This 5 bedroom, 3 bathroom house is located right between two great beaches, Sandy beach and Pools beach. You are located on quiet side street, but still within walking distance to many bars/restaurants and gift shops. Click here for more details on this great property! Enjoy this villa with private gated parking, an amazing view and plenty of amenities. Within walking distance of numerous bars/restaurants, gift shops and more this property puts you directly in the Rincon culture! This is life on the Beach in Rincon! Wake up & check the surf without leaving the bedroom. Watch Humpback wales frolic from late January through early April from your dining table. Walk to great dining & night life. Can it get any better? Located on beautiful Sandy Beach, this villa is the perfect property for your Rincon excursion. Its modern decor and extent of amenities provide the perfect atmosphere and comfort you desire on your get-away vacation. Located directly on Tres Palmas Marine Reserve, less than a mile from the main town of Rincon you can be close to it all, yet removed at the same time. Be comfortable! This apartment has more than just a great location with air condition in all rooms, washer/dryer, cable TV, wireless internet, fully equipped kitchen, ocean view balcony and a swimming pool. Walk to one of the local bars/restaurants or stay in and grill out with your private gas grill while watching the sunset from the balcony. Come experience Rincon and all it has to offer! A little off the beaten path of Puerto Rico’s sunset coast, this stress-free oasis was created beside a beach that the locals have pretty much kept to themselves. Discover the pleasures of a relaxing place that you can call your home. Spend your evenings in your balcony sitting in a wicker chair and watching breath taking sunsets on another perfect day. This amazing villa consists of four apartments located directly on beautiful Dogman’s/Tres Palmas beach. Each apartment has two bedrooms and two bathrooms, indoor and outdoor living areas, a dining area, and a fully equipped kitchen. The two upstairs apartments have vaulted ceilings and a large covered balcony well furnished for your relaxation. The downstairs apartments have covered porches only steps from the pool and spacious sun-deck where your lounge chair awaits! Aside from the clean, attractively designed apartments, you’ll be enchanted by the wondrous caribbean landscaping. The apartment house is embraced by flowering shrubs and surrounded by a variety of palms, beach grape, almond, and ornamental trees. Join us! Located right on beautiful Sandy Beach in Rincon known for its great swimming beaches, breathtaking sunsets, and exciting weekend nightlife, Por Fin at Sandy Beach is a great place to spend your vacation. Step out your door onto a private back yard beach. Take a few steps down from there to the ocean for a morning swim. The unobstructed view of Aguadilla Bay makes the second story deck a great place to sip your morning coffee while planning your first day in paradise. Feeling ambitious? Start out on the beach at the house and walk the gorgeous shoreline for miles!!! After that exercise, lunch and a cocktail at one of the local beach bars can be guilt free! Sandy Beach is known for its thriving nightlife with world famous “Tamboo” just a short walk down the beach. With 5 bedrooms, 2 baths, and two well equipped separate kitchens, Por Fin Sandy Beach can accommodate your large group comfortably. We have tried to supply the house well, but a property manager is only a phone call away should you have any questions. All bed linens and towels are supplied, but we do ask that you bring your own beach towels. Oceanfront living with private beach access awaits at Maria’s on Maria’s Beach in Rincon, Puerto Rico. Maria’s is the newest, most exclusive rental compound on the west coast, your gated, secured, private oasis with every amenity to make your vacation, wedding or retreat a magnificent memory. Imagine asking yourself, “Do I sit by the pool drinking a rum punch today or pack a rolling cooler and chair for the beach?Do I surf or sand?” Such decisions are yours at Maria’s. Maria's is an 8 bedroom oceanfront villa, perfect for your large gathering (sleeps up to 16) ~ 6 full baths ~ two fully equipped kitchens ~ two dining tables for 12 ~ TVs and Bluetooth speakers for smart phones in master bedrooms and living rooms~ complimentary internet access ~ A/C and ceiling fans in every bedroom and living room ~ washer/dryers ~hot tub and full wet bar on both upper decks ~ ocean side spectacular private pool ~ gas grills on both patios ~ two of the bedrooms and bathrooms are on the ground floor, ideal for guests with limited mobility. Need just a 4-bedroom villa? Each side can be rented separately. Located in the exclusive beachfront community of Sea Beach Colony, in beautiful, Rincon, Puerto Rico, well-known for surfing, diving and spectacular sunsets, is the totally remodeled & renovated Casa Canal, a Spanish Style estate !!! Once you enter though the electronic gate & 10 ft walls, you'll experience a breathtaking view of the ocean & canal, passing by the center courtyard & pool with flowing fountain and find yourself inside a tropical landscaped oasis, on the ocean, with only the sound of the wind and waves to sooth your restless soul. Casa Canal offers luxurious accommodations with unique ocean-views. This 3 bedroom, 4.5 bath magnificent home is located on the canal with private beach access to the most beautiful swimming beach that Rincon has to offer, has a swim-up pool bar with 2 outdoor restrooms, hot & cold fresh water showers, back up power and water reserves, too many amenities to list !!!!. This property is a spacious 2,600 sq ft, 3 bedroom, 4.5 bath home that will sleep up to 10 guests and features, a new gourmet kitchen w/ granite countertops, stainless steel appliances, flat screen TVs, a downstairs handicapped accessible master bedroom with custom tile features, 2 upstairs bedrooms with (3) breathtaking Ocean view balconies, custom hardwood doors , a stunning Ocean View Den, with air conditioning & fans throughout the home. Conveniently located close to the Town of Rincon, within walking distance to (2) major hotels, many local condos & guesthouses, several restaurants, & great shopping. We welcome you to our property to enjoy your dream of a vacation in paradise! An ideally located surf retreat on Playa Maria in Rincon, Puerto Rico with epic sunset views and access to the water. Two villas provide plenty of space for you and your family/friends to spread out and enjoy a killer time in one of the most chill surf locations in the Caribbean. para Espanol amy@wndnwvs.com or 787-930-9653. Please click here to visit our website for more details! We are located in Barrio Puntas, the most peaceful and beautiful area of Rincon Puerto Rico. A unique area with uncrowded roads, sweeping ocean views, and not a street light for miles. The Boarding House Vacation Rental is a small family run business nestled in these hills providing a quiet retreat to travelers looking for a higher level of comfort and quality while still remaining within a reasonable budget. Contact Vanessa at 787.464.6023 or email at boardinghousepr@gmail.com Visit our site! Surf 787 Villa has six guest rooms and is open year round. You can rent 6, 7 or 8 bedrooms (depending on your party size). The Villa is a brand new, modern property with a swimming pool, ocean views, barbeque and parking for up 10 vehicles. The activity room has a pool table, ping pong table, dart board, board games, video games and work out equipment. The entire Villa is also available for rent, accommodating up to 18 guests. There’s no better place to relax and enjoy your vacation. Contact Surf 787 Call: (787) 448-0968 Email: surfsup787@yahoo.com Visit our site for more details! Neither words nor pictures can begin to describe the ocean breezes, tropical landscape, or colorful sunsets you’ll find here at Casa Por Fin dogmans beach . Whether traveling alone, or with a large group, you’ve found a rental that is sure to please. With 5 bedrooms and 3 1/2 bathrooms (6 bedrooms, 4 baths available in summer months), this villa can accommodate from 12-14 guests comfortably (16 in summer months). There is a fully equipped kitchen. The dining room and living room have a full wall of french doors that open out to a tree covered patio and the pool. The Large flat screen TV, DVD player, and an extra futon in the living room make you feel right at home. Whether surfing the waves or just surfing the net [highspeed wireless], dogman’s surf break is the perfect location! Look to the North and check out the waves at Maria’s, to the South, Tres Palmas. This great beach front location is available for wedding ceremonies, receptions, or just extra wedding guests. We are within walking distance to Maria’s, Tres Palmas beach, El Faro, and the Calypso Cafe. Steve and I live on the 2nd level of the villa during the winter months and are always there to answer any questions you may have! Visit our website for more details! On the beach with a pool!!! Great location on Tres Palmas beach with a view of Desecheo Island, and spectacular sunsets. Great snorkeling area where you can watch turtles and a wide variety of fish very close to shore. Each bedroom has a private bathroom and a king size bed [One king can convert to 2 single beds]. Fully equipped kitchen. Comfortably and tastefully furnished living area with leather sofa that converts to a bed. Within walking distance to Steps beach, Shipwreck and other marina restaurants, and the Marina Area where you can sign up for boat trips, parasailing, diving, etc. About 1 mile to town and all the action of Sandy beach but yet a private and quiet location to enjoy time with family and friends. Visit our website for more details! Located Steps from Sandy Beach! 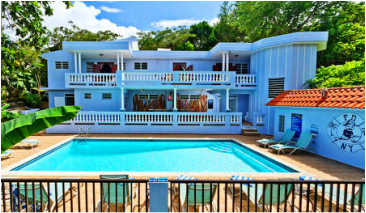 Punta Taino Guesthouse offers one bedroom and two bedroom studios and a second level 3 bedroom apartment, a few steps from Sandy Beach in Rincon, Puerto Rico. Come to surf, snorkel, whale watch or just relax, the Sandy Beach area of Rincon has it all plus great restaurants, nightlife, shopping and more. Our Rincon vacation apartments are newly furnished and offer comfortable, spacious rooms in a brand new property. A rooftop patio, shaded atrium and landscaped grounds provide shared outdoor space, while each guest room has a complete kitchen, air conditioning and Wi-fi. Sunset Paradise Villas... casually elegant, with beautiful sunsets, warm ocean breezes, and golden sandy beaches. Come experience one of the finest beach-front rentals in Rincon, Puerto Rico! Conveniently located between heaven and earth, you’ll find Rincon, Puerto Rico and our spacious, comfortable, oceanfront villas. You can enjoy your own private beach home, and be steps away from the Caribbean ocean. Come enjoy the tranquility of the ocean as well as the culture of Puerto Rico. Our accommodations provide an excellent place to watch the waves break, enjoy the ocean breezes, or simply relax in the hammock on your ocean side patio. The warm ocean breezes bring relaxation and the sunrises and sunsets bring priceless views and memories. Choose from 1 to 18 bedrooms... perfect for any size group!